Last spring, I finally completed a long-planned homestead project of constructing two hügelkultur beds. What is hügelkultur? 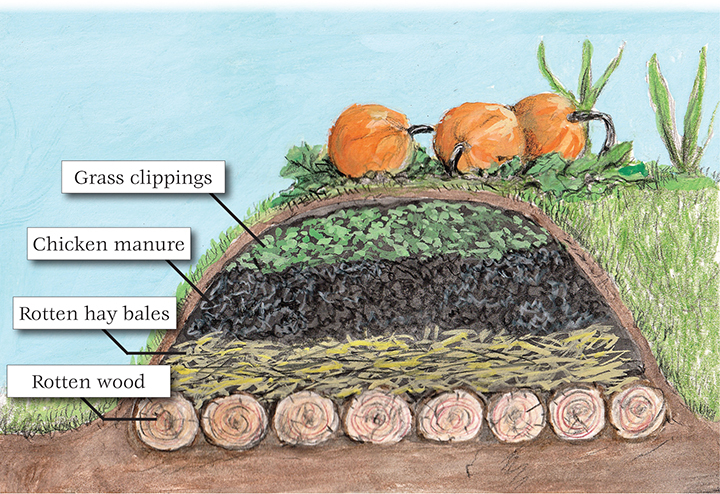 It’s basically a method of recycling junk wood to make a nutrient-dense and water-retentive garden. Hügelkultur is very similar to lasagna gardening, although the beds can be stacked as high as six feet and should look like hills. Hügelkultur could also be described as a giant, specialized compost heap. I did my research on hügelkultur after seeing it mentioned in Herrick Kimball’s The Planet Whizbang Idea Book for Gardeners. Using materials I had on hand. I created the beds over several weeks, although if you had the time, beds could easily be constructed in a day or so. Just like any other garden, a hügel bed needs sun. Since members of my family were concerned about the messy appearance of hügelkultur, I located my beds behind a small hill where they could get plenty of sun, but not be seen from the road. The first layer is wood. Anything from stumps to twigs can be used. Rotten (or punky) wood is actually perfect for this because the decomposition has already begun. Conveniently, the area I chose had piles of branches that had been left there years before. Thus, I simply gathered the available wood in the area into two long lines about six or so inches high and a foot or so wide. Since the wood layer acts like a sponge to hold water for the plants, it is critical to start with enough wood. Next, I added partially rotten wheat straw bales that were several years old. As I lined them up along and on top of the wood, some of the bales broke up. I just used the bales the way they came. For the third layer, I cleaned my chicken coop out and spread the contents on top of the straw. I use wood chips in my coop, so those became part of the bed also. Generally, it is recommended that you age chicken manure before using it to fertilize plants. However, since I use zeolite to control ammonia in the coop, I am able to use my chicken manure straight out of the coop. Lastly, I covered the beds with grass clippings, both to add more nitrogen and to provide a buffer layer between the chicken manure and the seedlings. The final height of the beds was around three feet high and almost as wide. Normally, hügelkultur beds should to be watered well to start decomposition. Unable to water my beds due to their location, I relied on the spring rains to soak everything. It rained in between the creation of the layers, and before it was warm enough to plant, it rained more. When I was ready to plant, I took a bucket of dirt and created “hills” in the beds for the seeds. I figured seeds would germinate better in dirt than in grass clippings. Hoping to deter our neighborhood deer, I mixed a little blood meal into each hill. I made six hills per bed. In May, I planted four varieties of winter squash, two varieties to a bed. I planted Blue Hubbard, Tennessee sweet potato, Delicata, and another variety whose name I forgot to note. Over the next few weeks, I checked on my beds. The seeds germinated poorly, due to a period of dryness after I planted. Some of the seedlings came up, then died or went missing. In the end, only one of the beds had plants. The bed had two hills each of Blue hubbard and Tennessee sweet potato. The plants grew extremely well, after taking a little while to get started. All of the leaves were a deep healthy green. During our dry summer (most of our state was in drought), the plants would wilt during the day but perk up again in the morning. I never watered the beds during the whole summer. I harvested in mid-September, since this is when the danger of frost starts. 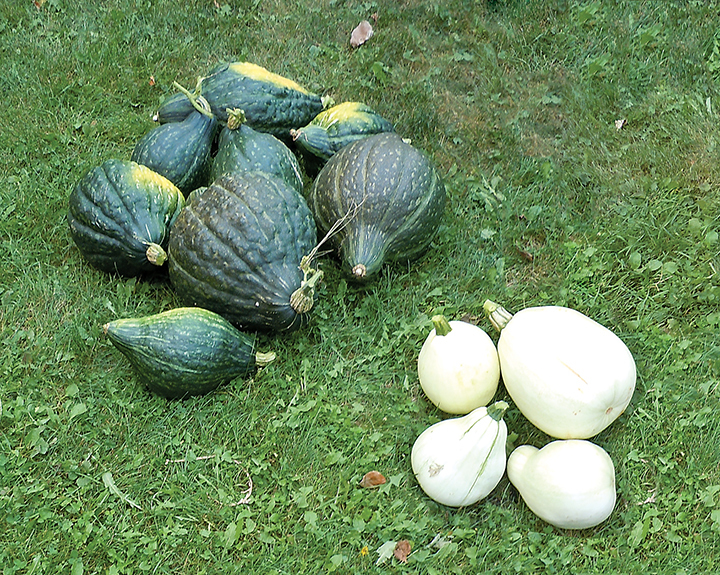 The total number of squash harvested was eight hubbards and four Tennessee sweet potatoes. Two of the hubbards were quite large, weighing more than 20 pounds. Since the materials were all “waste,” the return on my investment was excellent. I was pleased with my experiment and plan to use the beds again this year. I will probably construct a couple more beds depending on the materials I have on hand. Hopefully, you will give hügelkultur a try this year as well. Really enjoyed reading about this. Since I have all of the materials I will give it a try this Spring. Thanks!